Hi, there is Assertion Failure when interacting with shop keepers like Angel and Kyle during Maria quest. Angel can be avoided when he just pust the deed down and leaves. No such luck with Kyle. I wait 30 minutes of time before to begin to fight. So everything is in order. The civilians in sector Chitzena Mine just stand in place during battle, not even cowering as a gunfight occurs directly around them! Have only done minor editing to ini files, XML, no mods installed and I'm pretty sure that nothing I changed should have any effect on civilian AI. 1. Random crash on clicking one of the sort items/remove attachments etc. in the sector inventory. I get a black screen and and "Unhandled exception" error. Since it started occuring only after a few hours, I assume it could have something to do with one of the new items. - 40mm grenades just disappear from grenade launchers instead of being fired, and no APs where used. - sometimes enemies getting stuck in dying state, occasionally blinking. They still count as a red number on mercs portrait, even after battle is over. Sector can still get freed, so it is not completely game breaking. First and second bugs are my fault, already fixed in current version so get the latest build. You're right! I mixed up the builds. Proning merc using first aid kit on himself, first changes his stance to crouching position and playing grabbing animation+(\BattleSNDS\x_NOTH.wav). After that he's patching himself up normally. I believe it's just a cosmetic issue. When i press the pausebutton on my keyboard, the mouse cursor, the tile selector and the pause prompt itself flickers. Seems like if the game pause/unpause real fast. and wear off over time. Camouflage kits are only used for uncovered skin parts of the body which is the face. That's why the CAMO_KIT_USABLE_AREA is set to 5 (percent) per default. The rest of the body needs to be camouflaged by clothing and armor. Learn something everyday in v1.13, thx for that. The other issue was Son Mona was locking up in b8408 where Tony is, game freezes. I have yet to get back in b8409, will let you know once I go there again. San Mona can lock up when Tony tries to get to his position at the ring or back if the path or the position are blocked by someone. That's the problem with all NPCs that move somewhere by script (Brenda, Kyle or Angel for example). I have the save game where San Mona will not load correctly. It seems to drain all the memory and then freezes my machine. Read your message, what is the fix then? Besides start the whole game over. In that case try to open another door to the building or blow a hole in the wall. I never had to do the latter so far because the fight club has several entrances that can be unlocked. Bug about refuelling vehicles posted in another thread (in the bugs thread, below) but thought it best to repeat it here. V8404 and 8408, most recruited rebels now refuse to refuel vehicles. Maddog and all personal IMPs refuel as normal. Also, Shank can speak to Jake but Jake won't recognise he's now on the team. Only when someone else speaks to Jake will he realise Shank has been recruited. 1. Bug report: In Sector A9 Omerta, an enemy helicopter dropped off a team to attack my mercs which were training there. I went to the sector for the battle, it asked me to place my troops (makes no sense because they were already there). There was nowhere on the map perimeter to place them so I clicked "Spread". I received a Runtime Error Assertion Failure [Line 1144 file Map Edgepoints.cpp]. 3. On the save game, just advance time until the attack. Then go to the battle and click "Spread". 1. Bug report: In Sector J10 Desert my merc set a C4 explosive and then disarmed it. Upon picking it up, I received a Runtime Error Assertion Failure [Line 10826 file Items.cpp] GetRateOfFireBonus would crash. 3. On the save game, use "John" to set the C4. Then have him disarm it. Sorry, I couldn't reproduce it. I loaded your savegame in r8437 GameDir 2383, placed the C4 with John, disarmed it, placed it again and disarmed it again. No problem, he advanced his explosives skill by two points but no crash happened. Dang. Okay thanks for looking into it. I reloaded the save again today and was able to reproduce the error on my end. This mystery might remain unsolved. 1. Bug report: In underground Sector J13 Alma Mine there was rain and lighting (not sure why there would be weather events under ground). For an unknown reason, the game freezes after ending the turn. 3. On the save game, just end the turn. Lighting flashes, and then it freezes. Fixed in r8445, did not experience the freeze though. In r8446 I fixed an annoying bug with this feature: when an enemy airdrop occurred in a sector that had mercs, you often got to a point where you entered the sector, where prompted to place your mercs... and then couldn't do so. This has been fixed (unless I missed yet another method to start battles). 1. Bug report: I ran out of money and could not afford to pay the militia. Half of them were automatically disbanded. Yet their profiles still exist on the "Militia Overview" website. Also, I am still paying for them (daily expenses remains the same). The Militia Overview website also says I have 2 militia in Tixa, which I do not. I am not able to disband them. Not sure if intentional, but when I go to "About" on the Militia Overview website, it says Error 404 Not Found. Lastly, when I manipulate the militia in cities, I keep getting "Possible Error: Not Enough Individual Militia found in Pickindividualmilitia / Dropindividualmilitia / Getidofunusedindividualmilitia"
3. The save game is right before I run out of money. Just advance time until midnight. Take note of the remaining militia expenses and the remaining militia in Militia Overview. The dead website link originally was intended to simply 'hint' at possible future expansions of this. But as this is more confusing at the moment, I've removed the links altogether. i works with the latest files from SVN an the english ja2_7609en+AI_r460.exe. When i start the mapeditor with p_num_items 4 the are crash. Ja2Set.dat.xml and all other functions with xml files works fine. The game works with this 4 files ant the xmleditor also. My english is very bad. For german people please send me a message with your help!!!! You cannot use Ja2+AI with actual svn or anything that has "unstable" or "development build" or "main trunk" in it. It will also work with any mod based on stable 7609 release. So you need to chose if you use actual development build and latest svn or you use old stable 7609 with it's data and tools. With this installation come the same Error. I have no idea what i can do to fix this error. you? I have a clean stable 7609 and map editor works fine, so most likely you have corrupted installation or you are trying to mix different versions of gamedir and map editor. Has anyone of you an idea what I could look for? I am grateful for every suggestion! Have now just created from the following files a new game! the files from JA2_113_FullRelease_German_7435 then the batch from JA2_113_UpdateForRelease7435_German_7609 startet. What can I do to make my own Mod run reasonably? 1. Bug report: When removing items from the hummer I received a Runtime Error Assertion Failure [Line 1310 in file PopUpBox.cpp]. 3. On the save game, open the hummer inventory. Then move an item from the hummer into to the sector inventory. Then left click in the space where it used to be in the hummer. You'll receive the error message. 4. Running Windows 10, JA 2 1.13 build 8452 (06 Aug 2017). 1. Bug report: I was reloading everyone's weapons with alt+shift+r and received a Runtime Error Assertion Failure [Line 776 in file Item Types.cpp]. You will notice that for some reason the ammo on Liz's 7.62x51 weapon is purple. Not sure why it changed to purple at some point, but it is not AET ammo. 3. Load the saved game and press alt+shift+r to reload squad 3's weapons. You will receive the error. Sort of fixed in r8459. 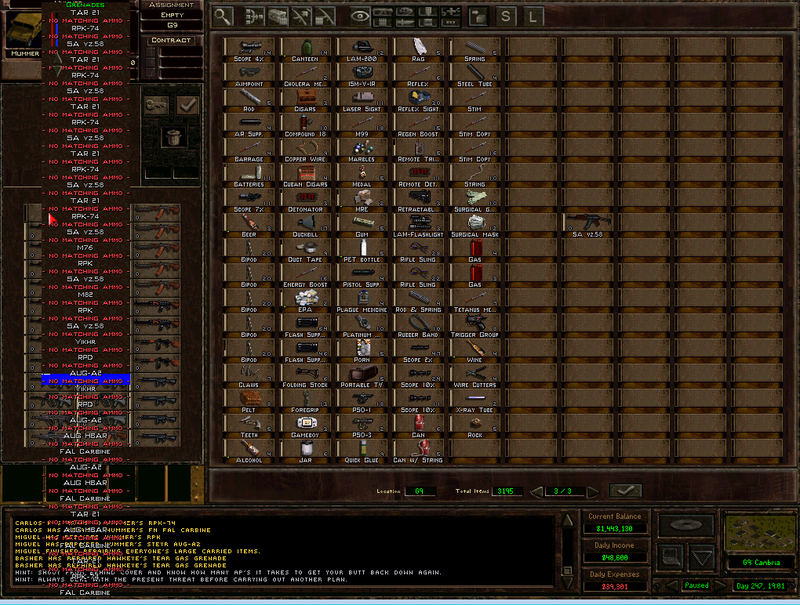 The issue is that when clicking on the inventory slot, we nowadays display all possible items that could fit in there. Sort of. I guess. This happens if the option Enable inventory popups is enabled in the options menu. The popup stuff is mountain of nested code, but it doesn't check whether the popup dimensions would fit on the screen, given the number of items you have in that sector (and the fact that almost anything can fit into a vehicle slot), you have more options than the screen can take, so... the game crashes. Fixed in r8460. The issue was indeed Liz weapon - the SCAR-H was indeed loaded with 7.62 AET ammo, even though such ammo does not exist. To be precise, it had 20 bullets, but no mag. I have no idea how you managed to achieve this, but I would like to fix that in case you find a way to reproduce that. For the moment, manually removing the non-existing mag simply deletes it, afterwards you can use the gun just fine. Thanks Flugente. If I manage to get the AET ammo again, I'll post the save game prior to it happening. I think it had to do with reloading the grenade launcher.